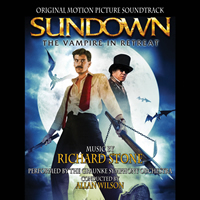 Previously released on compact disc in 1990 and out of print for many years, BUYSOUNDTRAX Records brings SUNDOWN: THE VAMPIRE IN RETREAT back to compact disc, featuring music composed by Richard Stone and conducted by Allan Wilson, performed by the Graunke Symphony Orchestra, with remastered sound by Digital Outland. The booklet includes new liner notes by writer Brian Satterwhite on the film’s production and the creation of this exciting large scale orchestral score. SUNDOWN: THE VAMPIRE IN RETREAT is a limited edition release of 1000 units.